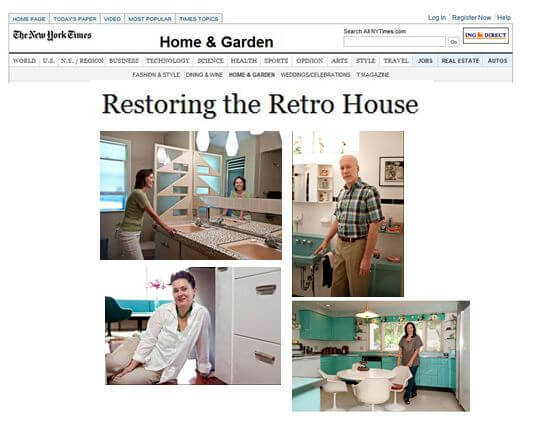 Home » Welcome to Retro Renovation®! 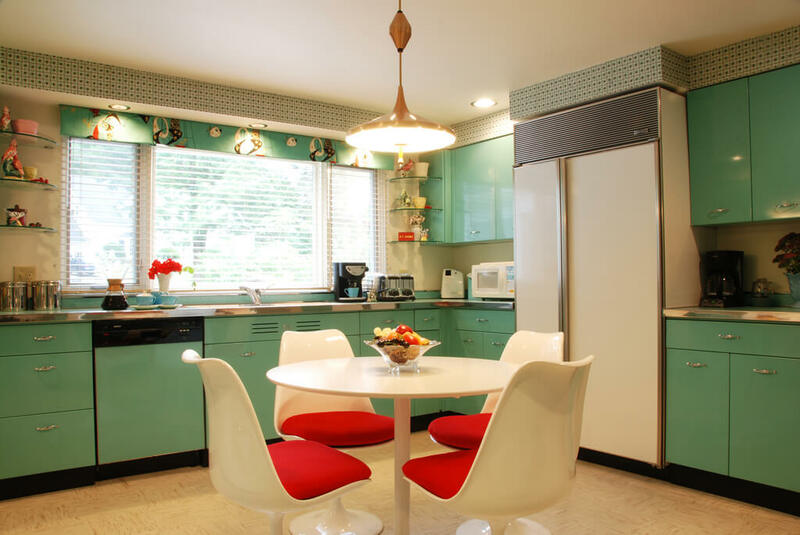 Welcome to Retro Renovation® — your daily dose of mid century and vintage renovation and decorating resources… design inspiration… fun finds… and a growing community of people all interested in cherishing their mid century and older homes. Dive into all our categories (in the navigation along the top of the page) and you will see, we have lots of research into all the products you might need to remodel and decorate. Along the way, we have lotsa other fun, too — always showing great gratitude and respect for the houses — and their owners — who came before us. Renovating, remodeling and living in our midcentury and vintage homes can be gratifying, but please always remember, there can be safety and environmental hazards in the surfaces, layers, materials and products in our homes. Anything old, even New Old Stock, that you buy also may have issues. We all care very much about managing safety and environmental issues properly, so when moving into a home … when undertaking cleaning, repair, remodeling or restoration projects … or when adding old materials (salvaged, used, new old stock, etc. )… be sure to get with your own properly licensed professionals to determine what you are dealing with/working with so that you can make informed decisions how to handle, become familiar with and use recommended best practices, and also learn about the proper disposal of debris, etc. Read more: See our Be Safe / Renovate Safe page … the EPA hosts a website on lead paint in the home and a website on asbestos in the home, etc. Consult professionals regarding these materials, and also about the proper disposal of debris, etc. <– I’m Pam Kueber. That’s me with my crazy wallpaper room… that’s my kitchen above — and this my blog, oh I luv it so. Doing all the research to find products to backdate my 1951 colonial-ranch house in Lenox, Mass., is what got me into this online escapade. 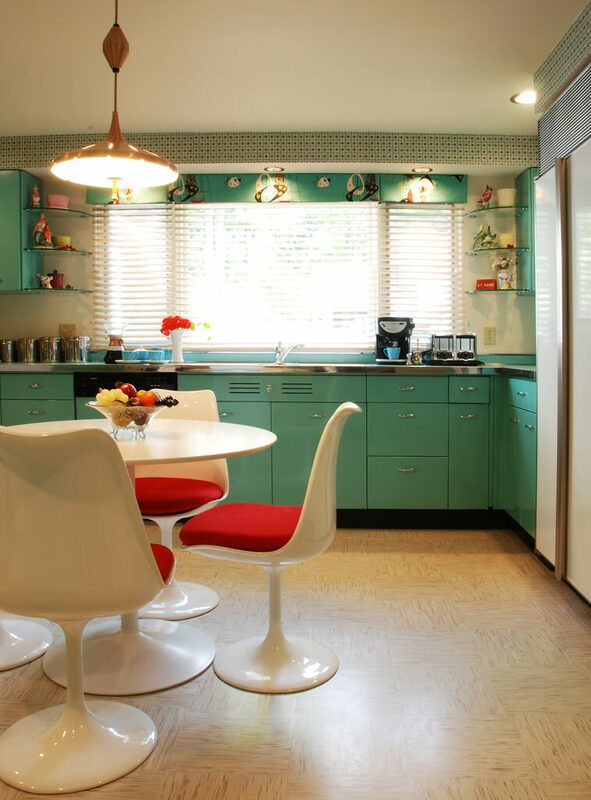 In the course of my endless hunt to find products and design ideas sympathetic to my house’s undeniable mid-century bones, I got…. obsessed… I learned a lot… and I figured, why not share all my finds with other folks undertaking the same journey. And now – you have arrived! This blog has lots about *modest, mid-century, middle-class* homes — ranches, Capes, Colonials, split-levels, contemporaries, bungalows. I also write about sleek *mid-century modern homes*… I love them all, but admit that I tend to worry more about the modest homes (themselves full of charm) being at more serious risk of being gutted, with regrets to follow later. 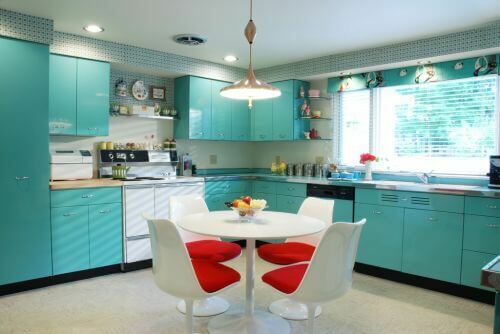 Interestingly, both mid-century modern and mid-century modest homes shared many of the same technological features and design cues (like pink bathrooms) inside. For further info see my Mid-Century Modest Manifesto and my micro-site SaveThePinkBathrooms.com. What do we gab about here? Well: The design aesthetic of retro interiors, exteriors, culture, people, steel kitchen cabinets, colors, pink kitchens, pink bathrooms, hudee rings, pecky cypress, illustrations with people playing accordians, wallpaper, pinch pleat curtains, mint-in-box items — and readers’ fabulous jewel box houses, too. Get ready to be sucked into the retro vortex. Above: As featured in the New York Times — yup, read all about our escapades in this 2,200-word feature story that appeared on p.1 of the Home & Garden section on Aug. 18, 2011. Hey, Lo0K! 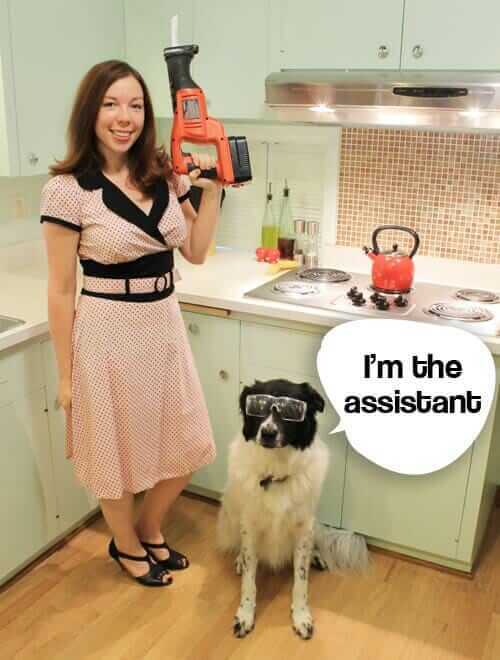 The blog made another American job — well, for a while at least Above: That’s Kate, Managing Editor, along with Assistant Leo. Kate worked fulltime with me on the blog for four years, ending Sept. 2016, when she left for a new adventure: motherhood! There are so many Kate stories that I’m leaving her here on this page. Note: I publish once daily (4:30 a.m.Eastern) Monday through Wednesday, usually not on holidays, and 24/7/365 if there if we spot important Breaking News in Retro Design World. Oh, and here’s me showing off one of a recent project — my office remodel. 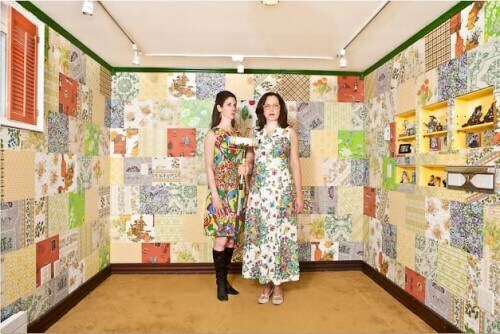 Which was epic: My friend Denise and I pasted 300 squares of vintage wallpaper on the four walls, creating a crazy patchwork quilt of 18 different designs of wallpaper. We celebrated by getting all Love American Style Gothic with the photo. 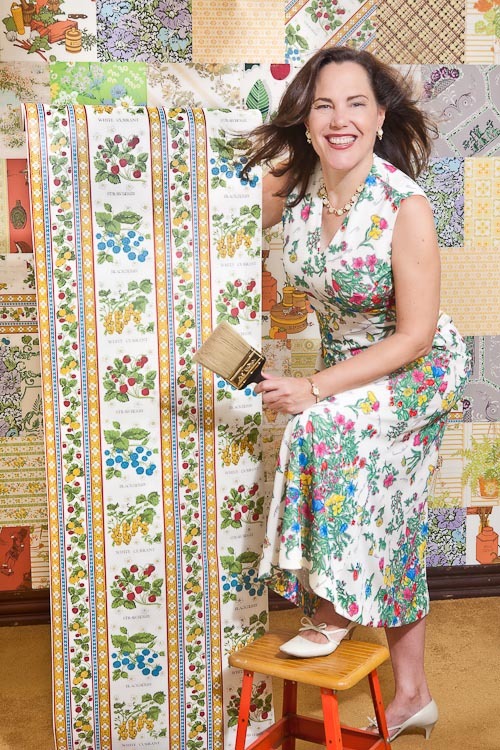 If you need ideas — or just love the era — be sure to check in for daily updates on new products to recreate that retro style…design tips…vintage finds…history…and more. To email me, click here. Washington Post: Hey, we got a shout out! Chronicle TV: Big story on my house and my kitchen and the Retro Renovation Revolution! The Times of London: Something is happening in smart bathrooms — Designers say pink is back after a long absence. Ummm: I got out of the habit of updating press coverage of the blog…. I’ll work on it again at some point… maybe. Huffington Post: The 10 Best Renovation Websites for Living out your Dream Home Fantasies. Fixing to Die: Retro Renovation® and a reader remodel featured on the blog inspired the setting and story line for Elaine Viets’ “restoration comedy” murder mystery, Fixing to Die. The book debuted #9 on the Barnes & Noble paperback list. 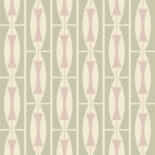 The Daily Mail (London) online: Give your Home the Mad Men Look! How one blogger inspires retro renovating tips. New York Times: Bathrooms In the Pink Again – (Top-10 Most Emailed stories for three days running). AP interviews Pam for story, Used Building Materials a Hit Among Home Owners, that runs in news outlets nationwide. On TV at the Southern Spring Home & Garden Show in Charlotte, NC. Press release on updates to the blog. On blog talk radio with Mitzi and Walt. 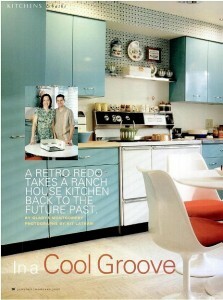 Old House Interiors magazine: This is the story that launched the entire blog! Margaret Roach, for all your support. AwayToGarden.com, Margaret Roach Media. Suzy Massey, for design support. PhoenixMassey Studio. Brad and all the Webdev team, for keeping the online bogeybots at bay. WebDevStudios. Erica Berger, for making me look good. Erica Berger Photography. Kit Latham, for helping me get into the dot.com world. KitLatham.com. Anyone interested in two vintage stainless 1954 Thermador wall ovens? I just took them out of our home. Working condition but the broiler coils are broke. tony: all buying/selling needs to go onto the Forum: https://retrorenovation.com/forum. good luck. I just found your blog through the Apartment Therapy Homie Awards, and I have to tell you, I literally FLIPPED OUT when I saw you live in Lenox. My husband and I live in Dalton and I work in Pittsfield. You are the first blog I have found from someone out in our neck of the woods. I love your kitchen and plan to check back often. Hi PAM!. coool website.. i feel bad now about remodeling my pink bathroom!.. i do have a question.. i am trying to purchase the square tile recessed ceiling lights you mention on your site, but can NOT find where to get them.. can you help? Gina, I have a post on these. I updated the post with a link to the Halo product guide where (at least now) you can find these fixtures. They are no longer on the website, as far as I can tell. All lighting resources are archived on the Product Guide Lighting Page. Steven & Michael create the Mondrian bathroom originally intended for their Alcoa Aluminum house – stunning! Get informed and be aware about the environmental & safety hazards in old homes, materials and products. #1 RULE: Consult with your own properly licensed professionals. More info: See our Be Safe/Renovate page… EPA asbestos website … EPA lead website … U.S.F.A. – fire safety, etc.